ICTP's scientific programmes and research activities in physics and mathematics provide many opportunities for women to engage in these fields. Through its efforts, ICTP contributes to the achievement of the Millennium Development Goal 3 to promote gender equality and empower women. The share of female scientists participating in ICTP activities has grown from an average of 10% in the 1980's to 20% in recent years. 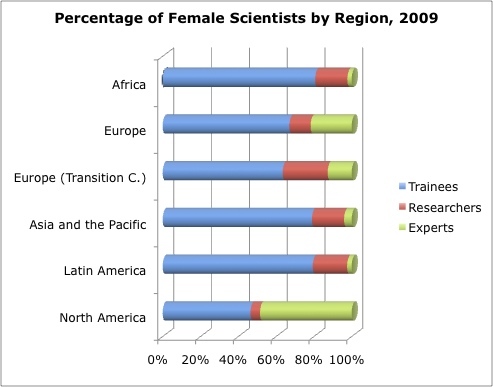 In 2009, 128 female scientists came from Africa, 262 from Asia, 139 from Latin America, 122 from transition countries, and 424 from developed regions. Ten Least Developed Countries (LDCs) were represented: Angola, Bangladesh, Benin, Lao PDR, Madagascar, Myanmar, Senegal, Sudan, Uganda and Zimbabwe.